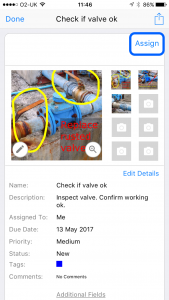 Site Report Pro allows users to assign Issues to other users of the App so that they can update the issue and assign it back. 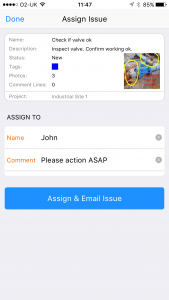 For example a site inspection manager may identify an issue to be resolved and assign it to the relevant contractor. 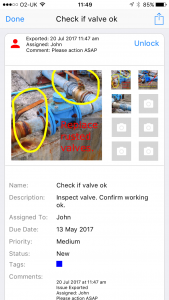 When the contractor has completed the work, they can update the issue with new information (e.g. photos, annotations, status etc). 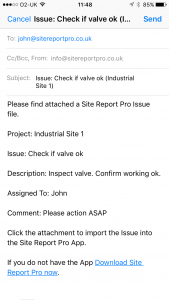 and assign the issue back to the site inspection manager. 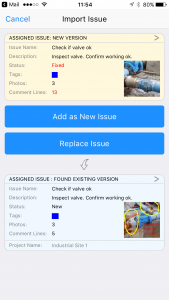 The site inspection manager can then import the updated issue into their project. Click the issue to be assigned, this will display the issue ‘card’. Click Assign at the top of the issue ‘card’. Enter the name of the person the issue is being assigned to and a comment. Click Assign & Email Issue, this will compose an email in your e-mail client. Enter the email address of the person being assigned the issue and click send. When an issue has been assigned to another user, it will then be locked to prevent further changes. The issue can be unlocked, however should the issue be assigned back and re-imported, then changes made to the issue will be lost. Open the e-mail containing the issue. 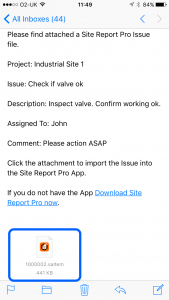 Click on the Site Report Pro attachment. 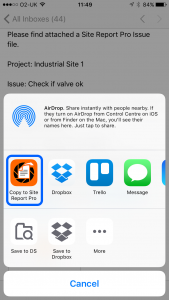 Click Copy to Site Report Pro. Choose whether to Add as New Issue or Replace Issue.